Planning a complete garden transformation and want to know where to get the best garden supplies? You've come to the right place – everything you could possibly want for your new garden design, in one handy sourcebook. We cover everything from hard landscaping suppliers to garden ornaments and garden tool suppliers. So take the time and the stress out of looking for the best garden products and suppliers – we've already done the searching for you. And once you've chosen the garden suppliers you need, find out how to plan, design and cost your garden transformation. A garden centre is likely to be your first stop if you're making over your garden, and it's highly likely you'll go to the one that's nearest to your home; however, it sometimes pays to travel that little bit further if you're looking for a wide selection of products at competitive prices. Pressed for time, on a budget, or simply want the easiest way possible to get all your garden supplies at once? A big, well-stocked garden centre is your best bet. Large, well-established chains such as Wyevale should cover most of the garden basics, from plants and tools through to gravel and garden furniture, plus they'll deliver. Let's start with the structural materials for your garden transformation. Patio paving is a good place to start your new scheme – it will be integral to your garden's design and will influence all other hard landscaping materials that you choose. Find out more about choosing the best patio paving for your garden. And be inspired by our feature on how to design a patio to get yours just right. Real stone is by far the most popular option for patios, and is perfect for creating a traditional, characterful feel for your garden. Real stone is also durable, though can be heavy. Picking a stone that complements your garden's natural surroundings will give you the best results, but look for limestone, York stone or sandstone for a timeless look that will go well with most garden design schemes. There are lots of places to get natural stone paving, including the garden centres above, but if you want to look at a wide choice, it's worth going direct to specialists; most of them will offer subtle variations of the same stone types, although if you feel like something a bit different, try The Natural Slate Co.
Man-made patio paving includes paving blocks made from porcelain, terracotta, and concrete. These types pf paving look great as part of contemporary garden design schemes, or for creating a link between your indoor and outdoor spaces if, perhaps, you want to choose a stone to run from a kitchen diner right outside on to the patio. Man-made paving blocks are durable, and are also typically more cost effective than natural stone. Replica patio paving uses man-made materials to make imitations of real stone slabs, and wood lookalikes, too. Again, this is a more cost-effective option than natural stone – and, in some cases, it can be more low-maintenance, too. Concrete, for instance, is easier to clean and re-seal than stone. When choosing bricks, whether as a patio paving or for building retaining walls, you'll want to think about the colour of your brick and mortar, as well as the colour, size and texture of your brick and the type of bond you opt for. While in isolation all these factors may seem to have a small impact, in combination they'll have a significant effect on the aesthetics of the brickwork. Let's face it, bricks aren't exactly something that you can change easily further down the line. When making a decision you'll want to think about how suitable each kind of brick is for your area, as well as the overall style you're looking to achieve. If you're in the Midlands, it could be blue bricks. That said, the age and style of your home could be more effective in determining the kind of brick that will suit your garden transformation. For Georgian properties, avoid anything too malty; for farmhouses ensure your choice isn't too mechanical or with precise, tight joints. If you're looking for an affordable and cost effective solution, clay bricks are your closest ally. Suitable for modern construction, they promise long-term sustainability and little maintenance for up to 150 years. Gravel is a cheap option that's easy to DIY-lay, although it's not practical as a primary surface if you have children because it's unforgiving on knees and hands, and it's easily transferred indoors. However, it's ideal for use on and around patios, rockeries and borders, and for paths and driveways, too. Laying a gravel path is perfectly doable for an experienced DIYer, again helping you cut the cost of your garden project. Use our guide to designing a driveway to find out all you need to know about that project. Loose gravel is a popular, low-cost option for creating garden paths and driveways. Typically, loose gravel is laid over a compacted stone base or straight onto the ground. Loose gravel is permeable, which is very important for keeping the ecosystem of your garden healthy. With loose gravel, however, expect imperfections and, over time, potholes (especially if using the gravelled area for parking). Resin-bound gravel uses epoxy binders to hold the gravel together once it's been laid. Resin-bound gravel will hold its shape for much longer and is weed resistant. Avoid anything that is term 'resin bonded' rather than 'resin bound', as it's not permeable and could cause flooding and other problems in your garden and surrounding area. Self-binding gravel is the perfect in-between option; if you want a firmer, neater finish than you'd get with loose gravel, but still want an all-natural material, self-binding gravel is the way to go. Unlike loose gravel that has been cleaned and is sold as separate, neat pebbles, self-binding gravel comes with the dust and particles naturally produced by crushing stone. As a result, when this type of gravel is being rolled out, the dust or sand that comes with it acts as a natural binder. Choosing soil correctly is essentialy to a healthy garden, and the type of soil and mulch you choose should depend on what type of plants you plan on growing. For borders and beds, you have two options: keeping the existing soil and simply adding a thin top layer of fresh compost, or digging up your topsoil and replacing it. The latter is much more effective in the longer term, although more labour intensive. Bear in mind that some plants, including hydrangeas, camellia, and rhododendrons, require acidic soil, so look for compost labelled 'ericaceous'. Lilacs and clematis, on the other hand, thrive in alkaline soil. It is a good idea to test your soil's pH before planning your planting scheme, as it's much easier to go along with what you've already got. Mulch in the winter and summer to protect the structure of your soil and to prevent fungal infections and other plant diseases. Read more about spotting and treating the most common plant diseases. The quality of topsoil in your garden will without exception determine how healthy and prolific your plants will be, so it's well worth the effort and extra cost to get the best compost possible. We especially recommend John Innes for bedding and container plants. The Compost Shop offer the full award-winning John Innes range of compost. The most important thing to remember about lawns is that grass is not the same as your other plants and needs mowing regularly. This is because new grass growth is always at the bottom of the plant, while old growth that needs to be trimmed off is at the top. If you don't mow your lawn, your grass may grow very tall indeed and eventually will go to seed. Grass is grass, right? Well, not quite. For best results, always buy your lawn seed from lawn specialists, as the seed quality will determine the quality and durability of your lawn. If you have children or dogs, we recommend going for grass labelled 'hardwearing'; and – avoid sowing sports lawn grass in your garden, as it's not suitable for residential use. Got your lawn seed ready? Find out how to mow a lawn for the best results year around. Now is the time to invest in a lawnmower, too. Choose from our pick of the best lawnmowers. When is faux grass appropriate? We say: as a temporary measure in a garden that has a damaged or unattractive patio area you won't be able to fix or remove for a while; and it's a great option if you have young children who will kick the heck out of a real lawn. Artificial grass is low-maintenance and good-quality types look quite natural. However, you will need to ensure you have adequate drainage (read, sub base) before installing it. And we strongly advise against using artificial grass in areas where natural grass may be used – it is actually easier to sow real grass rather than bothering with weed membranes for artificial turf. Decking has been a firm favourite for garden owners for many decades; hygienic, warm underfoot, and good-looking, decking is the perfect addition to a contemporary garden design scheme. The main types of decking available are softwood, hardwood, and composite decking. Which is best for your garden will depend on how much maintenance you're prepared to do and, to an extent, the look you're going for. Find out more about choosing the best materials for your deck and, if you are a competent DIYer, how to install your own decking. Fencing is typically sold by panel, so to work out the cost, you'll need to measure the perimeter of your garden, divide that number by the length of the panel, and then multiple that number by the cost per panel. Add installation costs and any additional materials such as gravel boards, which are needed if your fence will be coming into direct contact with the ground. Bear in mind that under current UK regulations, you need planning permission for a fence that is taller than two metres. This can become confusing, since many fencing panel sizes are provided in feet, so it's always best to double check with the manufacturer. From traditional fences to trellises and fence panels, the fence is an important part of your garden design. The style you choose should depend on several considerations, the most important of them being privacy. A trellis makes for a gorgeous climbing plant display, but is also the most open design that will offer you the least privacy. To maximise privacy, go for solid fencing panels. Iron fencing is the most secure and most durable, but will look very formal, and be expensive. Browse our gallery of garden fence design ideas for inspiration. Traditional fencing is woven from the flexible branches of willow, hazel, sweet chestnut and birchwood. We advise always going for coppiced fencing – that is, wood that has been cut in a way that allows the seed banks contained within to survive. This means that your fence will stay 'live' and will sprout new growth, making it wildlife-friendly and attractive. Your garden gate needs to complement the rest of your garden boundaries, so choose carefully. Many wooden fence manufacturers will supply wooden garden gates to match; alternatively, you can have a bespoke garden gate tailor made for your garden as part of an overall bespoke design. If your borders are made from brick or stone, a metal garden gate would look great (and, of course, is the most secure option). Browse our favourite garden gate styles for inspiration. Water features can make a fantastic addition to a garden; however, they are not maintenance-free, and it's important to remember to clean them regularly and check any larger water features for any wildlife that may have accidentally got in. You will need to check all water features regularly for algae, as these micro-organisms can be a source of harmful bacteria. If you have a pond or natural swimming pool, be very careful not to use pesticides or chemical weed killers in your garden, as these are likely to contaminate the water and kill the delicate eco-system of such a feature. To help you make an informed choice, we have gathered everything you need to know about garden water features in one handy guide. Solar water features are self-contained and come in two main types: with or without battery back-up. Unless you live in an area that consistently gets a lot of sunshine, models with a battery back-up are advisable. Mains-powered water features are the largest category and give you the most options design-wise. You will need electricity supply for the pump that drives the water movement, so think carefully about the positioning of your feature; all outdoor sockets will need to be weatherproofed, too. Self-contained water features can be either mains powered or solar powered – 'self-contained' refers simply to how much water you're using. A self-contained feature keeps moving the same water around and only needs topping up occasionally. In terms of positioning your garden lighting, you'll need to think about any features you might want to highlight, whether they're structural/architectural or based on how you use your garden. For example, you might want to light up your outdoor dining area. Find out how to plan your garden lighting in our guide. If you're planning on using your garden lighting into the evening, garden lighting is a must. The type of lighting you choose is largely down to personal preference, but some gardens (especially overgrown ones in quiet areas) will need security lights. If you live in an area that gets reasonable amounts of sunlight, consider solar lights. Want to add a bit of drama to your garden pond? You'll need special, water-feature compatible lighting. There are lots of options out there, including the high-quality Oase lighting. Oase pond lighting (shown below) is available from Bradshaws Direct. Solar lights are both eco-friendly and save you money; they're also easy to install, making them one of the easiest garden lighting options. We have the best solar-powered lights for your garden. The Henley Premium Solar Pillar Lantern is available from the Solar Centre. Garden rooms should be distinguished from summerhouses; as a general rule, a garden room is better insulated and therefore suitable for spending long periods of time in, all year round. Summerhouses, on the other hand, are mainly suitable as shelter during summer afternoons. Garden rooms make great home offices or home gyms, but you do need to be aware of height and size restrictions on building them. For more details and lots of practical advice, consult our expert guide to adding a garden room. And if you are looking for garden room design inspiration for a traditional garden, we have beautiful traditional garden room design ideas and oak frame garden room design ideas. For a modern garden design, browse our contemporary garden room design ideas. A bespoke garden room is the ultimate in garden luxury: an outbuilding that is tailor-made to your specific needs and is harmonious with the look and style of your home and garden. Bespoke garden room costs vary widely depending on size, materials used, and the design, and range between £800 and £1,600 per square metre. A garden shed is a must for the keen gardener – or for anyone who has a lawnmower/hedge trimmer. Always look for a shed with plenty of storage – or with enough room for you to build some. If you have a fireplace, indoor or outdoor, look for a shed with log storage. Browse our garden shed storage ideas and find out more about choosing a garden shed. These three garden structures are often mixed up, but they are different and have different uses. A pergola has a roof-like structure supported by posts, and its primary purpose is to create shade in a desired area in the garden. Garden arches are primarily decorative structures – think of them almost as arch-shaped trellises. They are typically used to create a focal point in the garden or visually separate one area from another, and can be used as support for climbing or trailing plants. Arbours are covered outdoor seats, often with an arch-shaped roof. Consider adding an arbour in a large garden as a relaxation spot. A pergola is perfect for creating a relaxation spot in your garden – and for showing off some climbing or trailing plants. Our selection of retailers covers both pre-assembled pergolas and self-assembly pergolas (see Perfect Pergolas). Find out how to build a pergola. The Eichner 2.8m x 2.8m Pergola by Lynton Garden available at Wayfair. Keen on growing a rose garden? Or perhaps you're planning on training a wisteria or jasmine? A garden arch is the perfect support for climbing and trailing plants. Metal is probably the best material for garden arches; if you get a wooden one, make sure you seal it to prevent loss of shape due to moisture getting into the timber. The Poppyforge Monet Arch is available at Greenfingers. How rigorous you are about choosing plants will determine both the overall health of your garden and the quality of your plant display. Our advice is to pay attention to the conditions in which the plants you are buying are being raised. A spacious and airy garden centre with plenty of natural light gives plants a much better start than a dark warehouse. Avoid buying any plants that are in bloom out of season – they will have been artificially stimulated with excessive fertilising, and you are more likely to have problems with such plants further down the line. Our one most important tip for choosing planters is: a planter does not replace a pot. All plants need adequate drainage, so always pot your plant up in a container with a drainage hole (even if it's just a plastic one), and only then place it in a planter. Avoid having plants standing in water; fill the bottom of your planter with gravel to prevent water-logging. Find out more about choosing plants for your garden and container gardening for small spaces. Our top tip for the beginner gardener is to avoid purchasing your plants from supermarkets (with the exception of Waitrose, which has a dedicated Garden department in partnership with Crocus). You need plant experts with years of experience who take care when raising their plants. If buying seeds, try to go for organic whenever possible. Garden pots are containers that have holes at the bottom, and can be made from terracotta or plastic. Garden planters, on the other hand, are mainly decorative and do not provide drainage. If you are using a planter, make sure your actual plant is housed in a pot with drainage first. If housing your plants in terracotta pots, bear in mind that they do not retain water, so you'll need to water more regularly than with a plastic container. Check out our pick of the best planters for indoors and out. The Rowlinson Marberry Wooden Barrel Planter available at Homebase. Choosing garden ornaments is all down to personal preference, but considering the size of your garden is also a good idea. A traditional garden statue will complement a larger garden, while the smaller, cuter ornaments, especially animal-shaped ones, will look great in smaller, quirkier gardens. How much maintenance your garden ornament will require largely depends on the material and finish. Stone statues will need regular cleaning. Find out how to restore a garden statue in our guide. Garden gnomes, ducks and hedgehogs, or a buddha statue? Whatever your preference, we have the best sources for garden ornaments online. The Copper Heart Birdbath Tree by London Garden Trading, available at Not On The High Street. Choosing garden tools can be a somewhat daunting task, given the huge variety of brands on the market. Our main tip is to go to a garden centre or warehouse and physically test out the tools you're considering buying, or at any rate hold them in your hands. It is important that the tool feels comfortable in your hand, that it isn't too heavy for you and allows you to grip it well. If you have reduced strength in your arms, you may want to consider lighter aluminium or plastic tools, but bear in mind that they may not be as effective or long-lasting as traditional stainless steel tools. To make an informed choice, consult our buyer's guide to the best gardening tools for maintaining your plot. Testing is even more important when it comes to choosing a lawnmower. You want to be satisfied that you'll be able to move it around, and, if the model is corded, that the cord won't constantly get in your way. What kind of storage do I have for a lawnmower? This will partly determine the size of the model you end up buying. To make the choice even simpler, we have buyer's guides to the best lawnmowers, from robotic to hand-held models; the best small lawnmowers for small gardens; and the best electric lanwmowers. The one crucial consideration in choosing appropriate garden play equipment for your kids is their age. The smaller your child, the more you need to think about the safety of your garden. A flat lawn to play on is all that small kids need. Toddlers will appreciate a trampoline, but choose one that has a safety enclosure. Older kids will love the fun of a climbing frame, football pitch, or treehouse, so your garden will need to evolve as they grow. Get more advice on how to make your garden child-friendly. Climbing frames need a flat, stable base and, if self-built, must be constructed to take the weight of adventurous children swinging off their extremities – you can always bury the wide footing supports if you don't want to see (or forever be tripping over them). Take a look at our buyer's guide to the best climbing frames for recommendations. Have a large garden and ready to make the most of it for the kids? Nothing is quite as special a treat as a treehouse. The type of treehouse you'll choose will depend on what type and size of tree (or multiple trees) you have in your garden. There are some type of trees that aren't suitable for supporting a treehouse, such as elms, so we recommend consulting a tree surgeon or landscape architect to establish whether your tree will be suitable. Some treehouses come with their own supports, so will not require a tree. Want something a bit simpler and more budget-friendly, but still fun for the children during the summer? A trampoline is a good option; when the summer is over, simply dismantle and store in your shed. Whether or not you have a toddler, opt for a trampoline with an enclosure. We have the best trampolines in our buyer's guide. No other single choice will determine the character of your garden design as your choice of garden furniture. With a dizzying variety of brands and designs out there, where do you begin? We say, think about the overall personality of your garden before you make a purchase. Try to choose outdoor furniture that is sympathetic to what your garden already is: if it's a rambling country garden, for instance, traditional rattan will be more harmonious with it than an ultra-modern set. A tiny urban courtyard will benefit from the slimline design of a metal bistro set, while a luxurious modern garden with decking can accommodate fancier, more expensive pieces. 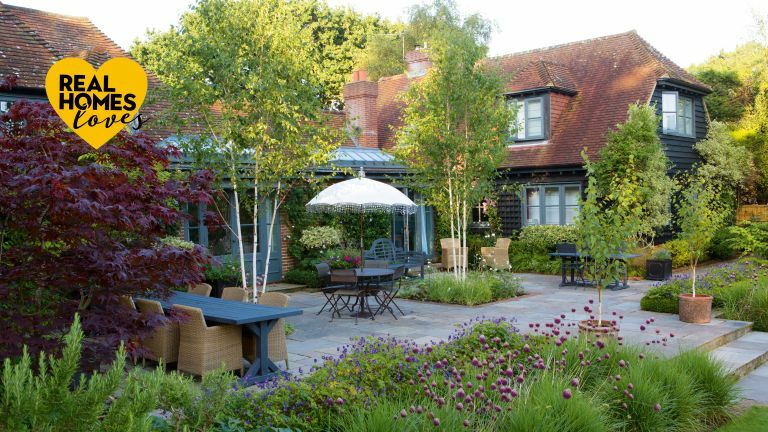 Get more practical advice on how to choose garden furniture in our guide. Rattan is lightweight, durable and elegant, and is a firm favourite of garden owners countrywide. AS a rule of thumb, if your rattan furniture is natural, keep it covered or indoors in winter. Synthetic rattan is more weather-resistant and can be left outdoors year round. Take a look at our buyer's guide to the best rattan garden furniture. Metal (coated aluminium) is the typical material for bistro garden sets, which come in a variety of styles and colour finishes. Metal garden furniture does eventually suffer the effects of wet weather, so regular maintenance is important. Find out how to revive metal garden furniture in our guide. We also have a buyer's guide to the best metal garden furniture. The Mia aluminium furniture set is from Lazy Susan. If you are a fan of al fresco dining, then an outdoor dining set is a must. How you choose yours should depend on whether you want to create an outdoor dining area that's permanent, or would prefer something portable that can be put away when you're using your garden for a different purpose. The two main things to consider when choosing a barbecue are 1) whether you want your barbecue to be a permanent feature in your garden, or you'll be using it only once in a while, and 2) how many people you're planning to cook for. The latter point should determine the size of the cooking area you'll be going for. A cooking area of 2000cm² should cover most people's needs, but if you are cooking for more than six people in one go, you may need to go larger. Barbecues are such a firm favourite with garden users the world over, there are literally hundreds of options out there. To keep the very long story of barbecue choices short, we'll just say that your main choice is between a traditional charcoal barbecue and its various fancier alternatives (all of them are covered in our buyer's guides): the powerful gas barbecue, the electric grill, and the smoker (lovers of hot smoked salmon and ribs will especially want to look at those). Anyone who has lived through a British summer will know how unreliable the weather is even during the warmest months: one week it's a heatwave, another it's cold and pouring with rain. And if you like sitting out in the garden in spring and autumn (and perhaps on sunny days in winter), too, then adequate outdoor heating becomes even more important. Depending on how much you're prepared to pay, and what appeals to you visually, there are several options. An outdoor fireplace is the most luxurious (and costliest) solution, and can be either freestanding or built into a wall. Then there are the chimeneas and fire pits, which have the benefits of being portable and, with some models, suitable for making a pizza or toasting marshmallows. These can usually be burnt in your garden without restriction, provided they don't generate too much smoke. Patio heaters are another option; they can be either freestanding or hanging, and are powered by either gas or electricity. Find the best patio heaters in our buying guide.